In order to make more L’Brondelle, money is needed. Money to travel, for resources, etc. Please help this program continue. If you want to know what you are being asked to fund, watch the show (in 2 parts) below. I implore your sense of justice. TV rarely puts anything on that is creative or interesting unless it can show some audience support, so they know its not a major risk. If you feel that tv doesn’t reflect your sense of humor, or put on shows that you would watch, but have been frustrated that you have no means of swaying the broadcasters, this is your chance. IF you feel that interesting artists are ignored, and want a way to help support something unique, please, this is your chance. 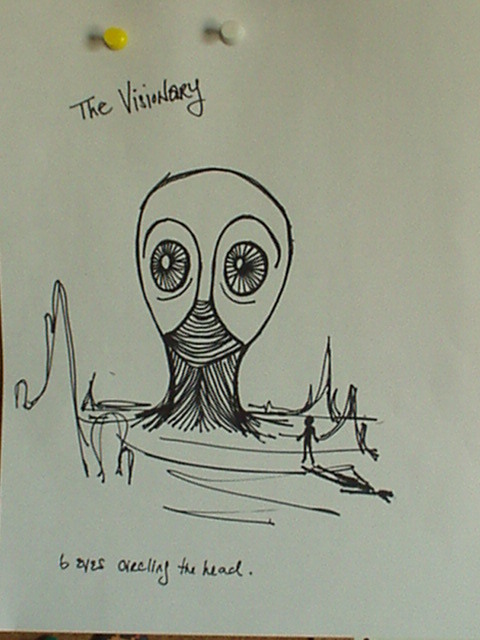 The Visionary – a Large head with 5 faces for a total of 6 eyes. While dormant, the visionary has a smooth head of obsidian, no facial features, and exposed muscle fibres on its neck. When the priests insert their hands into the muscle fibers, nerve fibers invade the skin. The priest’s head loses all features, turning black. The Visionary’s faces appear, and its eyes open. The priest and the visionary are one, and he can now see in every direction for many miles. Look forward to our comic. it won’t make sense probably. This website has some interesting, TRUE knowledge about the future. it predicts my death, specifically. I got to talking about christmas with someone recently, who asked me if, as an atheist, i celebrate christmas. The notion seemed absurd to me. Why would I not celebrate christmas? What has it got to do with religion? He didn’t seem to understand what i meant, and we argued. According to him, christmas is a christian religious holiday where adherents celebrate the nativity of christ. According to me, christmas is a pan religious festival from pagan religions that celebrates in various ways the birth of the sun, the sun god, the return of the sun, the solstice, all basically sun related, but that evolved into a simple festival where people go to their parents house, eat turkey, and exchange gifts. There’s nothing religious about turkey, family, or gifts. There’s nothing religious about sales, shopping, Jesus only seems related to christmas when you watch tv, and they might occasionally show a manger, or mention going to church. You don’t see jesus in the manger even a tenth as much as you see santa claus on people’s lawns. If you are christian, you can go out and encounter all the christ you want. But if you’re not, you can avoid any mention, image, or reference to christ, except in the name of Christmas itself. This argument seemed irrelevant to him though. As numerous peoples of other religions, and a horde of atheists, celebrate christmas, as a cultural or social holiday, like mother’s day, halloween, labor day, or easter. Whatever their origins, what religious value do they possess these days? None, i argue. If you feel differently, please tell me so. If you agree, please tell me so. “It’s the boar to end all boars!” he shrieked, sweat beading on his furrowed brow, large pores like little gnome holes. “I’m almost certain that you mean the war to end all wars.” Smooth. “yeah, but. Then you’re just doing a pun. “Not in this case. The “or to end all ors” phenomenon is a well documented ocurance in the natural history of the universe. The Toast Men of Yummiwheat Prime, for instance, have a saying: the floor to end all floors. Their race is unusually ill adapted to finished surfaces. The Hurled Egg, last remnant of the Unhurled Egg empire, often calls people up at 3 am to tell them that he forgot divert clouds of ionized gas into the pellicular onyx recumbancy in the Dryas sector. Sigh, he sighs, the chore to end all chores. And then there are the Wigglers who live on the Tickle Planet of nice touches. They say, after the giggling hour, “that was the Zhorga to end all Zhrogas”. Of course, with their accent, Zhorga sounds like “door”. They don’t mean door though. Heaven help you if you ever learn what they mean. Heaven help you. THere are…” he drifted inward to some hidden place of memory, so deeply buried it comingled with instinct, and fears ageless and unnumbered. “There are,” he continued, “certain tickles that a man may never recover from. Certain, ” he licked his lips and swallowed tensly, his voice begining to crack, his mouth dry, “certain moist tickles.” He pressed his hands to the sides of his head, as though is head were a basketball and he had no idea how to play basketball. I guess he appeared to be in great pain, but the truth was, that I appeared to be really casual and cool at that moment, so to get flustered and react in a panic, man, that’s not the epitome of coolness. That’s the epitime of foolness. And I do mean “of”. As i traipsed away from the screams of a man who, for all intents and purposes, was crushing his head between his hands in order to prevent certain moist memories from surfacing to consciousness. Funny thing, that, how we all have heads. I mean, in our own way. I walked out onto the Bloor to end all Bloors, heading my stylish way to Honest Ed’s, a garish mutlifloored labyrinth of discount items and free vital services for recent immigrants, wherein I meant to locate some mouthwash, and get a large upright fan. Frown life wasnt’ all bad; they had upright fans. Truly, this was the store to end all stores. They just invented a computer that never runs out of batteries. Yes, but this one keeps recharging, as long as you use it. it’s a deadlymachine.. it kills you to use it, but, if you dont’ use it, the batteries wear out. Every so often the machine willl tell you that someone is thinking about you. that’s its sole benefit. Maybe it has no benefits, and people are just evolved to serve th eneeds of the machine, even when its self defeating. no, they invent a gun that kills people UNLESS you shoot them.